"Welcome back lil' buddy!" - GameNation adds yet another stunner to it's already impressive catalogue. Now I must confess the last time I played a Sonic title was waaaaay back in the day when Sonic poked his pointy head onto the Sega Mega Drive and it was absolute bliss. Now he's back and just as brilliant as ever on the Gameboy Advance. I must admit it was weird to see Sega's flagship character on the Nintendo machine but the sheer class of the game brought back so much old school fun that I just didn't care! All of the old friends are back: Sonic, Amy, Knuckles and Tails against the evil of Dr. Eggman! 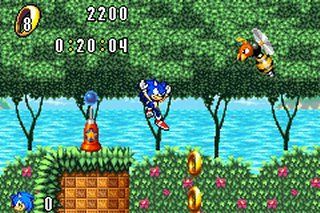 The beauty of the game is that the game style changes from character to character and not since the early days has Sonic looked so damn good in 2D. The sounds are a dream and totally true to my fond memories of the series, complementing the game absolutely. Animations are great and all the old moves are present. Level design is immaculate and the old goals of collecting rings features prominently. 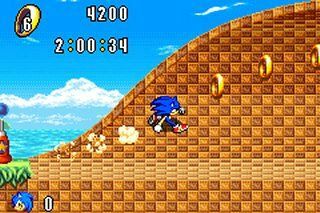 Enough rings have to be found to unleash Super Sonic in the final battle against Dr. Eggman. The longevity of the game is staggering with basically 4 modes of single player and link ups available against other Advances. An exciting feature is the fact that you can link this game to the Gamecube and raise "Chao" in the mini garden. Naturally Australian gamers will have to wait till May to experience that! 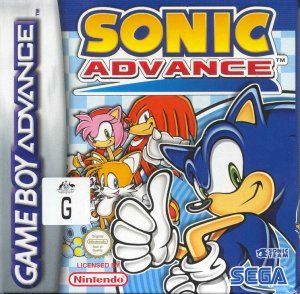 The power of Nintendo's hand held system really shows in how effortlessly it handles this brilliant 2D adventure making Sonic Advance a must buy addition to your Gameboy Advance collection! Welcome back little hedgehog! It's great to see you!